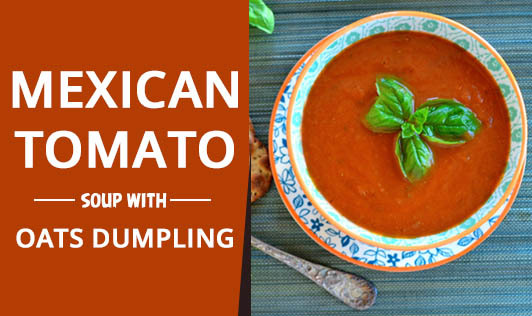 This soup combines traditional Mexican flavors like tomatoes, cilantro, and chills, and ads in bite-sized oats dumplings for a soup that is rich and filling without any meat. This soup is quick and easy to make. Oats are a great source of fiber and eating them regularly can help to lower cholesterol. Not only that, but they also help you to feel fuller for longer. • To prepare soup, heat 2 teaspoons oil in a cooking pot over medium-high heat. • Add onion to it and sauté for 3 minutes or until tender. • Add chili powder and garlic, sauté 30 seconds. • Add broth, wart, oregano, salt & pepper, chickpeas, and tomatoes, bring to a boil. Cover the pot with the lid and reduce heat, and simmer for 20 minutes. • To prepare dumplings, combine grounded rolled oats and 1/8 teaspoon salt in a bowl. • Add 3 tablespoons of hot water and 1 teaspoon oil, stir until a soft dough forms (dough will be dry). • Divide dough into equally small pieces, shaping each into a ball. Add dumplings to soup, cook, uncovered, for 3 minutes or until dumplings float. • Stir in cilantro and lime juice. • Ladle 1 cup soup into each of 4 bowls, top each serving with 1 tablespoon cheddar cheese.